Alexandra Phanaruk, Year 9, won the Junior Girls Section at the Independent Schools Golf Championship on 18 March at Waverley Golf Club, with a score of 80. She has now qualified for the Independent Golf Championship at The National Golf Club, Long Island, on 27 May. Congratulations Alexandra and good luck. 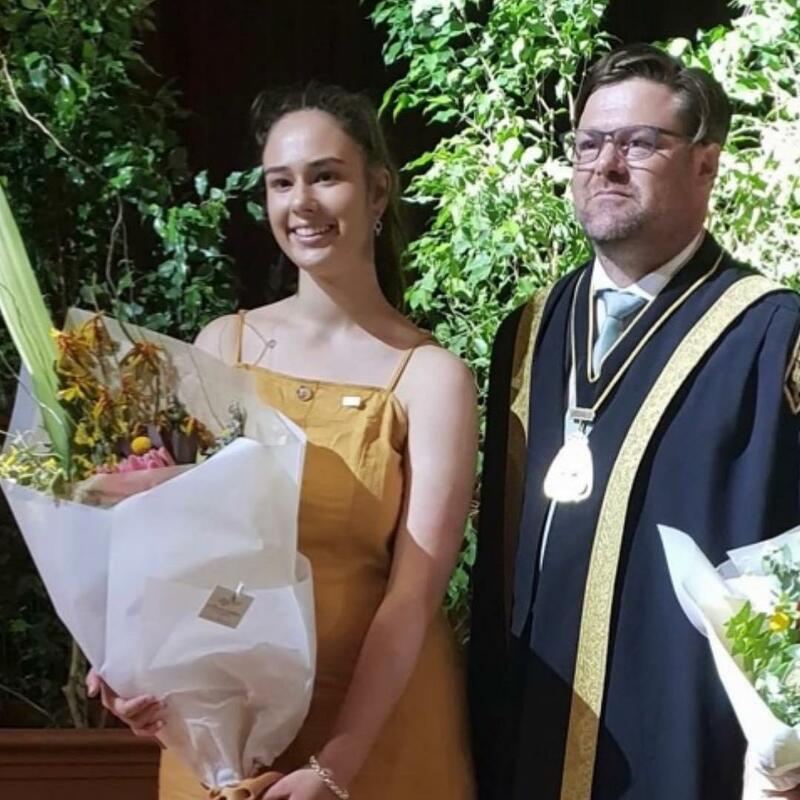 We are proud to announce that the Hobson's Bay Young Citizen of the Year is Mount St. Joseph Girls' College Year 12 student, Layla West. Layla was awarded the title for her work in junior sports development and championing of Down Syndrome awareness. Congratulations Layla! We are delighted to announce the 2018 VCE Dux is Isabella Cassetta with an ATAR of 96.6. At the Academic Assembly on 5 February 2019, the College celebrated the excellent achievements of the 2018 VCE and VCAL graduates. We welcomed back our 2018 College Dux and other outstanding award winners who shared their Mount St. Joseph Girls' College school journey of courage, determination, engagement and commitment to pursuing excellence. Students who achieved the Subject Dux awards and the Top 20 ATAR scores, along with those who achieved 40 or more in individual study scores, were recognised. The College Assembly was a wonderful celebration of students’ success with family and friends in attendance. This was followed by lunch with all staff who have played an integral role in the lives of these young women. The College Dux for 2018, Isabella Cassetta, achieved an ATAR score of 96.6. Isabella's reflection to the College community focused on her achievements and efforts and the commitment of all teachers across her time at the College. The 2018 College Dux achieved an ATAR of 96.6, Isabella Cassetta. Annie Tabone received a perfect score of 50 in Visual Communication and Design. 11.46 % of students achieved a study score over 40 in one or more of their subjects. In 2018, there were 83 Study Scores above 40 and 18 subjects with study scores over 40. Fifteen students successfully completed their VCAL Certificates. From September 29 - October 15 2018, Year 10 student Alia Pollard attended Advanced Space Academy in Huntsville, Alabama, USA. Alia participated in mission simulations, engineering challenges, mini lessons on different aspects of space travel and space, team-building activities and physically challenging activities. "The best part about this experience for me was the mission simulations, in which you are assigned a position either in the control room, on the ISS, or on the shuttle and must try and complete all tasks to ensure the mission is a success. In the second one of these missions, I got the amazing opportunity to be shuttle commander, and although I cannot land a shuttle to save my life, getting the opportunity to try and to flip all these levers that would control your life or death in reality was amazing." We celebrate the achievement of Year 11 student, Ella Bibby, who is the Victorian winner of the National History Challenge (Year 11/12 Category). Ella's submission, based on the competition's theme of "Turning Points", investigated the Kokoda Campaign as a turning point for the course of WWII in the Pacific Region. Ella presented her submission at the Victorian finals in September and was selected to proceed for national judging, which occurred over the holiday break. Ella received her prize at a presentation on Friday 19 October 2018 at the History Teachers Association of Victoria Conference in Melbourne. We are all so very proud of Ella and the hours of research that she put into her submission. A special thank you to Ms Laura Thompson, our Library Research Officer, who assisted Ella with her research.